Wash mutton. 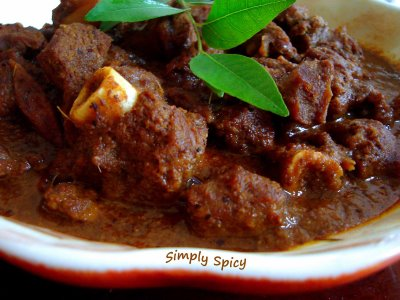 Apply ginger - garlic paste, green chilli, Sauf powder and salt to mutton and keep aside to marinate for 1 hour. In a grinder blend coconut, jeera, garam masala and keep aside. Now in a vessel, fry onions till they turn golden brown. Add red chilli powder and fry for some time. Then add marinated mutton fry for 2 minutes and then add water and cook till the mutton pieces are half cooked. Now add the blended coconut mixture and then tomatoes. Cook it for some time till the pieces of mutton get fully cooked. Serve hot. You can hove it with chapati or rice.